Empty nesters Susan and Whit Hill recently brought Harpo into their lives. 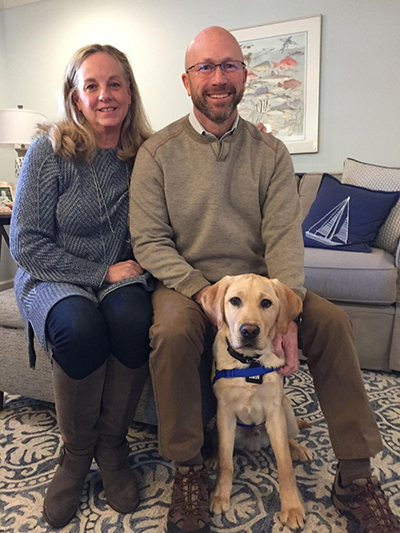 The Trantwood couple, who have two grown children, a granddaughter and a cat named Skeeter, will raise the 5-month-old pup from Canine Companions for Independence until May 2020. “We’ve always valued volunteerism,” Susan Hill said. And they have always had dogs, sometimes two at a time. “This was a perfect combination of loving animals and having them around, and serving others,” she said. The Hills chatted at a restaurant with someone who was raising a puppy; at his feet sat a well-behaved puppy wearing a yellow and blue Canine Companions’ vest. They learned about the program, and how the highly trained dogs eventually become beloved companions to children, adults and veterans with disabilities. Susan Hill was convinced she wanted to participate, but her husband admitted to being reluctant at first, since the dog would eventually be returned. But he realized how they’d be helping improve the lives of others. So, they applied to be puppy raisers for the nonprofit organization founded in 1975. After a lengthy phone interview, they were approved. A male Labrador retriever mix was born on Aug. 26, and they said “Yes, we want him,” Susan Hill recalled. Harpo and the other dogs are from the organization’s breeding program for Labrador retrievers, golden retrievers and crosses between the two, located in California. At 8 weeks old, they are sent to one of the six U.S. training centers. The Hills traveled to Long Island, N.Y., for Harpo in October and participated in an in-depth orientation at the training facility, which Susan Hill described as impressive. Currently more than 1,300 puppies are being raised in the U.S. for Canine Companions. Harpo has adjusted well to his new home. “It’s a lot like having a new baby,” said Whit Hill, as he watched the playful pup energetically chew on one of his many toys. The Hills are teaching him basic commands, including “visit,” which instructs the dog to put his chin on the handler’s lap. “He’s really smart,” Whit Hill said. They practice socialization skills, file monthly progress reports and attend obedience classes with him. He gets lots of love, attention and walks, and sometimes goes to work with Susan Hill at Grace Bible Church. Next year they’ll take him back to New York a multi-month training program for Harpo. Professionals will teach him more than 40 advanced commands, such as pulling wheelchairs, turning off light switches and more. Then, he will go through a two-week team training with his selected recipient. If all goes well, a matriculation or graduation ceremony will be held, and the Hills will be invited back to participate. Puppy program manager Debbie Knatz said the dogs wear capes and rosettes around their necks. The puppy raisers walk up on stage and ceremoniously hand off their four-legged graduates to the new owner as they begin a life together. Many times, puppy raisers and the new owners keep in touch, and develop lifelong bonds, Knatz said.